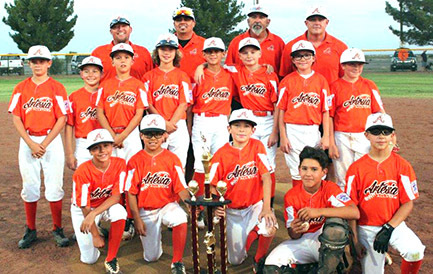 Artesia Little League’s 9-11-year-old All-Star team took the District 2 Championship Wednesday at Jaycee Park. Artesia defeated Lions Hondo 3-1 and Noon Optimist 17-2 in the opening rounds of the tournament, then topped Noon Op again, 11-1, for the championship. The team will now advance to the New Mexico Little League Sectional Tournament, set for July 13-15 in Albuquerque.